SharePad is packed full of useful financial data. This data holds the key to understanding the financial health and value of any company you are looking at. To a new or inexperienced investor the mass of numbers may seem a little daunting. That’s quite understandable but it shouldn’t be. If you understand basic arithmetic then you can understand a company’s finances with a little bit of effort and the help of SharePad. All these statements are linked and show how money moves around a company. To be a good investor you need to understand what’s in these financial statements and what the numbers mean. If you can master this, then you are well on the way to being a better investor. I’m going to explain the three main statements before getting on to how to use them. I’ll start in this chapter with the balance sheet. Before a company can start generating sales and profits it usually has to invest some money to buy things to help it do that. It will use money from its owners (shareholders) and possibly a bank loan to buy things such as land, buildings, computers and stocks of goods to sell. A balance sheet is arguably the most important of the three main financial statements. You should study it closely before investing in any company. A thorough study of company’s finances can take a long time. With SharePad though, you can breeze through one in a matter of minutes once you’ve grasped the basics. A balance sheet shows a company’s financial position at a specific point in time – usually the end of a year. This is an important point. A company’s balance sheet tomorrow will look slightly different than it does today. It is made up of all the company’s financial transactions over a period. Companies publish their balance sheets every year in their annual report and accounts. Companies listed on the stock exchange will publish them every six months and sometimes every three months. I’ll explain what these terms mean shortly but this is the way that most UK companies present their balance sheets. Before we start looking at a real company’s balance sheet, I’m going to spend a little bit of time showing you how a balance sheet works in practice. Hopefully, once you understand the basics, you’ll be able to get a better understanding of a real company from looking at its balance sheet. Let’s look at a very simple example to see how a balance sheet works. A friend of yours – let’s call him John – has inherited £50,000. He decides to buy a house for £100,000 to rent out. He uses £40,000 of his inheritance as a deposit and borrows £60,000 from a bank. He keeps £10,000 on hand to spend on the house. John sets up a property company and his accountant draws up the first balance sheet as shown in the table below. The balance sheet has two sides to it. One side lists all the company’s assets (what it owns or is owed) and its liabilities (what it owes to others). The value of the liabilities is taken away from the value of the assets to calculate a figure known as net assets. The other side of the balance sheet looks at how those net assets are financed by the company’s shareholders. As you can see, the balance sheet balances. Net Assets does equal shareholders’ funds or Equity. I’ll explain some of the terms you find in a balance sheet shortly. Hopefully, what you’ll see is all the transactions reflected in it. Assets of the house and the cash add up to total assets of £110,000. Take away the outstanding mortgage of £60,000 and we are left with net assets of £50,000. In the US, net assets might be referred to as net worth and is an estimate of what might be left over if all the assets were sold and all the liabilities were paid off. On the other side of the balance sheet, there is the £50,000 that John inherited and invested in the business which is shown as share capital. The rest of the balance sheet is made up of reserves. The most significant one is retained profits – profits that have been earned but not paid out to shareholders. This is zero because the business hasn’t made any profits yet. So shareholders’ funds are £50,000 – the same as net assets. Every financial transaction a company makes will affect the balance sheet. But it will still always balance. I’m going to show you a couple of examples to show you how this works out in practice. John decides to spend some money on the house to make it more appealing to potential tenants. He spends £5,000 on furniture and a new central heating system. This is how the balance sheet evolves after he has done this. Again, the balance sheet balances and the net assets and equity are still £50,000. All that has happened is that the cash balance has gone down by the £5,000 spent by John and the fixed assets number has gone up by the same amount to reflect the money that has been spent on furniture and the central heating system. No new money has come into the business, nor has any profit been made so the shareholders’ funds or equity number is unchanged at £50,000. John soon finds some tenants and after a year he finds he has made a profit of £5,000 after he has paid out all his expenses and paid the taxman. He decides to retain this profit in the business instead of paying himself a dividend. I’ve shown you how a balance sheet is presented for UK companies if you were to read their annual reports. If you are looking at the balance sheet of a US company in its annual report you will notice that it is laid out differently. This is nothing to worry about. The numbers are still the same and the balance sheet still balances. Let me explain how it’s done. So if John’s company was in the US and his finances were in dollars rather than pounds the balance sheet would look like the one below. As you can see, the balance sheet balances just in a slightly different way. On one side of the balance sheet are all the company’s assets. On the other side are all the company’s liabilities and the shareholders’ equity. You don’t need to worry about how balance sheets are laid out. It’s what the numbers mean to you as an investor that really matters. I’ve shown you the US format of a balance sheet, because that’s how you will see the balance sheets of companies in SharePad. They will be split into three main sections. You can see an example of a SharePad balance sheet below. All balance sheets work on the same basic principles. It’s just the number of transactions that go into them which is different. In short, assets are what a company owns. Liabilities are what it owes. Equity is the value of the shareholder’s stake in the firm since it began trading. This is equal to the amount of money they have invested plus any profits that have been retained in the company. It is also the same as the company’s total assets less its total liabilities. Above is Tesco’s balance sheet as you will find in SharePad. I’ll now explain the main terms within it. Stock (called inventories in the US) is generally defined as goods held for resale. Work-in-progress is goods that are part finished. Raw materials used to make goods may also be included within stock and work-in-progress. Tesco was holding £3.57bn of stock and work-in-progress at its balance sheet date. Debtors are amounts of money that are owed to the company. Sometimes in SharePad it is not possible to separately disclose the different types of debtor. However, in most cases, the biggest type of debtor for a company is known as a trade debtor. This is money owed to it by customers for goods and services sold where the cash has not been received. The most common way a trade debtor is created is by selling goods or services on credit. Tesco had £5.5bn of debtors (less prepayments) at its 2014 balance sheet date. This should end up as cash that flows into the company’s coffers during the next year. Prepayments are created when a company pays for services in advance but has not yet received them. This might be something like paying for stock which has not been delivered. They are treated as an asset because they are effectively owed to the company. Tesco had prepayments of £369m at its last balance sheet date. There is of course a risk, normally very small, that the goods or services won’t be delivered and that the money will have to be written off. A company may decide to put some surplus money into bonds or shares to earn a higher return than cash in a balance sheet. These are classified as securities. Cash doesn’t need any explanation. Tesco’s last annual balance sheet had cash and securities totalling £3.6bn. Intangible assets can be bought by a company or developed within it. They are not always easy to value and there are rules for how these are presented on the balance sheet. The values you will see are net values after a charge known as amortisation has been deducted. Amortisation is a cost incurred each year that companies are required to charge against their revenues which in turn reduces their profits. This annual expense is meant to match the cost of the intangible assets against the revenues that they generate over their remaining useful lives. So if a company had an intangible asset with an original cost of £10 million that had a life of ten years and would be worth nothing after that, a company might choose to evenly charge £1m per year in amortisation (known as a straight line method of amortisation. Some businesses such as pharmaceuticals, computer software or consumer goods companies can have very large intangible assets on their balance sheets. Tesco has £3.8bn. The figures you will see on the balance sheet are what are known as their net book values. These are calculated by taking the original cost of the asset less the amount of accumulated depreciation. Depreciation is a very important number in a company’s financial statements. It is similar to amortisation and is charged against the value of an asset over its estimated useful life. It can be interpreted in different ways such as the loss of value of an asset or an estimate of the annual amount of money that a company needs to spend in order to maintain the asset in its original condition. Tesco has a lot of tangible assets – supermarket buildings and all the fixtures and fittings inside them (such as shelves, fridges and tills) as well as the land they are built on – and they are by far the biggest part of its balance sheet totalling £24.7bn. Tesco’s total assets (current plus non-current assets) were £50.164bn at the last balance sheet date. This figure will include the value of stakes in other companies (where the ownership stake is 50% or less) known as joint ventures and associates. It will also include long-term investments in shares or bonds. Accruals – an estimate of an amount for goods and services used but where no bill has been received. Tesco had £21.4bn of current liabilities at its balance sheet date, mostly made up of trade creditors. Provisions – amounts set aside for future costs based on a decision already taken. e.g. demolition of a factory site. All these total just over £14bn for Tesco. Tesco’s total liabilities added up to £35.4bn at its 2014 balance sheet date. Take this number away from the £50.164bn of total assets and there is £14.7bn of net assets left over. Share capital – there are different kinds of share capital. The most common type is ordinary shares. The value of share capital is the number of shares that have been issued multiplied by a nominal or par value. This is the minimum amount that shares can be issued for. In Tesco’s case this is 5p per share. Share premium – is the amount above par value paid for a share. So if Tesco issues and sells 1,000 shares for 100p each, £50 is allocated to share capital with the remaining £950 allocated to the share premium account. Retained profits – profits that have been made by the company that haven’t been paid out as dividends to shareholders. In very basic terms, the shareholders’ equity of a company amounts to the amount of money paid in by shareholders (share capital + share premium) plus all the retained profits. In 2014, this figure was £14.7bn for Tesco. As a balance sheet must balance, this is equal to the value of its net assets. 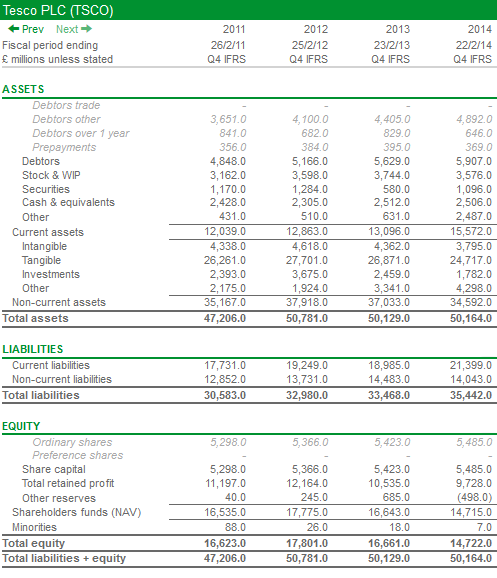 All these numbers in the balance sheet help to explain a company’s financial position. As for what they mean for you as an investor, I’ll tell you in the next chapter.